Nestled along the foothills of Southern California’s picturesque San Gabriel Mountains, the University of La Verne has established a reputation during its 127-year history of challenging students to broaden their minds, test their limits, and explore their values. The University is located approximately 50 kilometers east of downtown Los Angeles in the city of La Verne, California, a vibrant family community with a population of 33,000 featuring tree-lined streets and well-kept homes. Close to three major freeways and an international airport, La Verne is convenient to Southern California’s world-famous attractions (Disneyland, Hollywood, Rodeo Drive) and natural playgrounds (beaches, mountains, deserts). Geographic Diversity: Students have enrolled from the following countries: Albania, Argentina, Australia, Azerbaijan, Bahrain, Belgium, Brazil, Cambodia, Canada, China, Ecuador, Egypt, El Salvador, France, Germany, Hong Kong, India, Indonesia, Iran, Italy, Japan, Kazakhstan, Kenya, Lebanon, Madagascar, Malaysia, Mexico, Mongolia, Myanmar, Nepal, Nigeria, Norway, Pakistan, Paraguay, Peru, Philippines, Poland, Qatar, Russia, Saudi Arabia, Scotland, Serbia, Singapore, South Africa, South Korea, Sweden, Syria, Taiwan, Thailand, Turkey, United Arab Emirates, United Kingdom, Venezuela, Vietnam, Yemen, and Zambia. International Student Services: The Office of International Student Services offers assistance in transitioning to life as a university student in the United States. Services range from visa support to social activities. Financial Aid: Merit scholarships are available for international students. Test Score Requirements: A minimum score of 80 iBT, 550 PBT, or 213 CBT on TOEFL; La Verne also accepts a score of 6.5 or higher on IELTS, 460 on the Evidence-Based Reading and Writing section of the SAT, 176 or higher on the Cambridge English: Advanced, or 53 on the PTE. Today, La Verne continues to accentuate learning and leadership and enables graduates to achieve more than they ever imagined! Home to nearly 2,900 traditional undergraduate students and offering over 45 undergraduate majors, La Verne is rated among the topnational universities by U.S. News & World Report and fourth among the category’s private schools located in Los Angeles County. It’s also one of only 55 institutions across the country to receive the Higher Education Excellence in Diversity Award. The University comprises four colleges: the College of Arts and Sciences, the LaFetra College of Education, the College of Business and Public Management, and the College of Law. Asan institution, it is founded upon a mission to provide opportunities for students to achieve their educational goals and become contributing citizens to the global community by promoting four core values—ethical reasoning, diversity and inclusivity, lifelong learning, and community and civic engagement—that encourage a positive and rewarding life. The La Verne Experience is infused with student studies, activities, and interests and embedded within the community and civic engagement component of the University’s mission statement. The Freshman La Verne Experience (FLEX) enhances students’educational experiences among a community of scholars. More than 30 FLEX Learning Communities place incoming freshmen with similar interests in the same set of three classes designed to lay the foundation for success inside and outside the classroom. FLEX’s unique educational opportunities help students engage with faculty and classmates in three linked classes—two distinct disciplines and a smaller writing class. 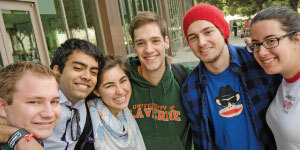 La Verne focuses on the individual, believing each student adds unique value to the campus community. It features a student-faculty ratio of 15:1, and 65% of classes have no more than 19 students. Professors are passionate, personally engaged, and committed to helping students achieve their academic and professional goals. Students also have access to the University’s free tutoring service, the Academic Success Center (ASC). The ASC provides academic assistance across disciplines. Eligible students also have the opportunity to become paid tutors. Immersion into campus life at La Verne through activities speeds development and expands awareness. Whether living on campus or commuting, student involvement is simply a matter of taking the time and making a commitment. There are plenty of opportunities to participate in more than 80 student clubs and organizations on campus, as the University provides an active environment. To help students with job placement, the University’s Career Services Center provides an array of services, including résumé and cover letter assistance, mock interviews, career fairs, workshops, internship opportunities, and career counseling. La Verne is an NCAA Division III member school and competes in the Southern California IntercollegiateAthletic Conference (SCIAC). Witha sports tradition spanning more than 90 years, the University fieldsnine men’s and nine women’s varsity teams with rosters buoyed by more than 550 student-athletes. La Verne continues to garner attention from those who measure the quality and impact of higher education on the national level. Publications and organizations that rate the country’s top institutions continue to recognize La Verne among the country’s best. Washington Monthly ranked La Verne48th on its national universities “Best Bang for the Buck” list. Forbes placed it in the top half of its “America’s Top Colleges” rankings, which recognizes the top 20% of the nation’s undergraduate universities. U.S. News & World Report again has La Verne in the top tier of its “America’s Best Colleges” national universities category. La Verne recognizes the contributions that international students bring to our campus, and the University remains committed to awarding high-achieving students with merit scholarships that range from $5,000–$23,000 per academic year. In addition, incoming students can apply for a performance scholarship in art, communications (video production), music, photography, speech (debate), or theater. Recipients will be awarded $25,000 annually, with the fourth year paid in full.